SPY rose by 4.8% this week, while my account fell 2.6% to its lowest level ever. 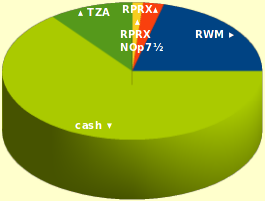 I bought TZA, thinking that the small-caps would go down, but instead they had their best week in two years! RWM: Combined the already-sold puts into a single ”old puts” item whose value is frozen. All changes in put-value are now assigned to the remaining live put. This seems more sensible. As expected, the $31 put expired worthless. There were no bids and so I couldn’t sell it for even a penny. Next week it will be combined with ”old puts”. SCHA: Last week’s sale settled on Tuesday. My MACD-based system gave a ”buy” signal on Tuesday, but I didn’t buy because it seemed overhead resistance was too close. But the market zoomed past the resistance. I should have obeyed my own rules. Discipline! TZA: Bought on Monday, even though I have not yet back-tested any system for deciding when to sell it, because the news coming out of Europe suggests an implosion is imminent. Bought more on Thursday because the rally seemed to be running out of steam (MACD gave a ”sell” signal). The market had better go down soon!